Again at Queen and John! I know you might be tired of the snow pictures already, so here are my excuses: I've been super busy at work lately to take/process more pictures, and the snow pictures were taken while I had to go from one studio to another and was waiting for a streetcar forever and when it didn't come I walked back, so I ended up with quite a few photos so I'm posting them! The good news is my camera survived the crazy snow, although it was soaking wet. 1. If you're not shooting in full manual it's a good idea to set your camera's Exposure Compensation to +1.0 since the camera's metering usually tends to under-expose when fooled by the white coverage. 2. 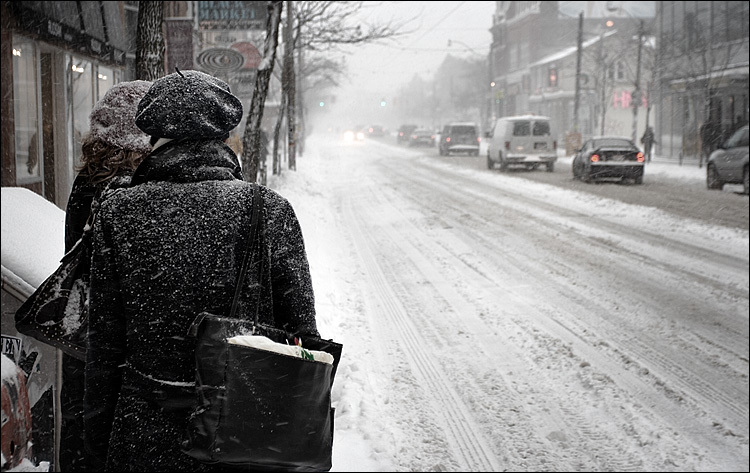 I usually shoot in Shutter Priority mode (Tv in Canon) to get the look I want for the falling snow. Depending on the wind speed a shutter speed between 1/80s to 1/125s usually produces a nice streak line for snow which has a dynamic look to it that I like (like yesterday's photo). Shooting slower than that mostly makes the snow disappear or turn them into super long lines. Faster than that will make solid non-moving snow flakes in the air which might be the effect you're looking for, but lacks the sense of motion and direction. And lastly, I have more books available. If you're interested send me an email or wait until I make the book page.